When it comes to massive phones, nothing is more iconic than the Samsung Galaxy Note Samsung Galaxy Note II Review and Giveaway Samsung Galaxy Note II Review and Giveaway The Samsung Galaxy Note II is an Android Jelly Bean driven hybrid between a smartphone and a tablet. Its key features are a 5.5-inch large HD Super AMOLED display and an integrated active stylus, called... Read More . It has gained popularity not only due to its size, but its additional features such as a stylus and a larger battery make it a more useful phone. Samsung released the third generation of the Galaxy Note in October, updating the phablet with a larger screen and improved hardware. Read through our review, then join the giveaway to win the Samsung Galaxy Note 3! Of course, other Android competitors haven’t let the $640 Galaxy Note 3 be the only player in the phablet market. There are others such as the Sony Xperia Z Ultra, the Samsung Galaxy Mega, and the other more common phones that are reaching 5″ screens such as the Samsung Galaxy S4, the HTC One, and the Nexus 5. Unlike the normal-sized top contenders, the Galaxy Note 3 has a bigger screen and larger battery. It also offers specific features (surrounding the S Pen stylus) that aren’t found on any other phablet competitor. There are various things that might stick out to you, but the two most important ones are the processor and supported bands. First off, the processor for this particular model is an octa-core developed by Samsung. This is the first phone or phablet to sport an octa-core processor, which in itself is downright insane. Additionally, the bands supported vary wildly, so you should expect to use the Note 3 model provided by your carrier if you’re in the US to be able to correctly connect to the network. The N9000 doesn’t support any LTE connectivity at all, but instead you get an octa-core processor to play around with. It’s cool to brag that fact to your friends, but the Snapdragon 800 is also an exceptional processor. There’s a handful of things you get in the box with the Galaxy Note 3 N9000. The list includes the phone, a manual, a power supply, a USB data/charging cable, and some adapters for the power supply. You’ll note that the USB connector is blue, and the other end is a bit bigger but based on a regular microUSB connector. It’s actually a specialized connector for the Note 3 which can utilize USB 3.0, benefiting from the increased data transfer rates as well as the faster charging rates. As you’ll see in a bit, however, this new connector is not mandatory — you can still plug a regular microUSB connector to the Galaxy Note 3 and it will behave normally. It’s massive. Samsung increased the display size from 5.5 inches on the Note 2 to 5.7 inches on the Note 3, and it’s easily evident as soon as you pick it up with your hand. Otherwise, it looks very much like an enlarged Galaxy S4 from the front. The backside received a makeover — the rear plastic cover that protects the battery, Micro SIM card, and MicroSD card now emulates stitched leather. Don’t think that Samsung treated its Note 3 owners to something fancy — while it looks like leather, it’s still just plastic. It feels a bit softer than a completely flat cover, but it’s still made from the same hard plastic. It just has a texture on it whereas the Galaxy S4’s cover, for example, has a glossy finish. But at least it looks nice after getting used to it for a little while. The Samsung Galaxy Note 3 appears to be made primarily out of plastic, as you’d expect from Samsung phones. However, it does have a small built-in bumper that seems to be made out of metal, which should allow you to grip the phablet easier as well as protect from bumps on its sides. Despite the acceptable-at-best choice of materials, the phone is still solidly built. There’s no creaking when pressure is applied to multiple points on the phablet, and there aren’t any physical blemishes either. Thanks to its high-performance processor (the model I tested came with the octa-core variant), everything behaves buttery smooth, even with the 1080p resolution. It’s certainly a step up from the Galaxy S4, which comes with a slower-clocked octa-core processor or the Qualcomm Snapdragon 600, depending on the model. Honestly, I haven’t seen a single stutter while testing out the Note 3, which is fantastic. Part of these performance improvements also stem from Android 4.3 — however, once the Note 3 gets updated to Android 4.4, it should run even smoother. The battery life is pretty good. Because the octa-core only uses the four low-power cores when its idle or performing “light” tasks, the system only sips on power. The larger display does require a bit more power, but not nearly enough to use up all of the battery’s extra capacity. Therefore, while you won’t see a proportional improvement compared to the Galaxy S4, you’ll still end up with a slightly longer battery life. Expect at least 5 hours of screen-on time on WiFi, whereas the S4 would sometimes struggle to get to that value. The screen is bright, sharp, and displays great colors — as to be expected from Samsung’s AMOLED display technology. Although the Galaxy Note 3 has a lower pixel density than the Galaxy S4 Samsung Galaxy S4 Review and Giveaway Samsung Galaxy S4 Review and Giveaway Samsung's current flagship device, the Galaxy S4 marries no-compromises hardware with Google's mobile operating system, slathered with a thick layer of Samsung's own software overlays and customizations. That doesn't mean the outcome is perfect. How... Read More or the Nexus 5 Google Nexus 5 Review and Giveaway Google Nexus 5 Review and Giveaway Approximately a year after Google released the Nexus 4, the company behind Android has come out with its successor -- the Nexus 5. Read More , I don’t really see a noticeable difference between the two pixel densities. I’m sure that things are theoretically sharper (including text) on the Galaxy S4 and Nexus 5, but I really think that the Note 3 is good enough. The automatic brightness feature on the Note 3 can be controlled — another feature that I like about the phablet. While it still does its job automatically, you can set the automatic brightness to be a bit brighter or darker than it defaults to. This way, if your screen is normally a bit too dark when you have it set to automatic brightness, you can now change it so that it still adjusts accordingly but to a level you prefer. The setting can be changed in the drop-down panel, which value ranges from -5 to 5. Not only is the display responsive, and also accepts input from an S Pen — the specialty feature of the Note 3. You can do plenty with the S Pen, including handwriting notes (with various actions such as automatic conversion into a contact if you wrote down someone’s info), writing onto pictures and screenshots, drawing, application windows, and all of the same functionality you can do with your finger. All of these functions appear in a little pie-style menu that pops up whenever you pull out the S Pen. I especially like the application windows, which is another form of Samsung’s multitasking where you can essentially create new windows that run apps inside of them. These windows can also be resized from their original drawn-out dimensions. Otherwise, the drawing and writing functionality is pretty straightforward — they’re useful and fun, but not necessarily good at increasing your productivity on the device. The camera uses a similar apparatus as found in the Galaxy S4, which means that you’ll still be able to take fantastic pictures with the Note 3. It also sports a 13 megapixel lens, but the capabilities vary slightly by model. You should be able to shoot 1080p videos, but some models offer 60 fps recording while others only offer 30 fps. In any case, the quality is fantastic, and is still better than the Nexus 5. The Galaxy Note 3, despite its larger size, only sports a single speaker. Similarly to the Nexus 5, this speaker is now along the bottom edge of the phablet rather than the lower backside of the device. The speaker can also get pretty loud, and quality is acceptable. It’s just missing some bass to make it sound amazing. I’d say that it’s on par to the Nexus 5’s speaker (if not a tiny bit better), but the clear winner is still the HTC One with its two front-facing speakers and fuller sound with Beats Audio. Similar to the Galaxy S4, the Note 3 contains a lot of additional Samsung apps such as the S Health app, ChatOn app, and more. Ultimately, as far as the software goes, there’s very little difference between it and the S4, with the exception of the S Pen software. And yes, that means that the TouchWiz UI is included, whether you like it or not. 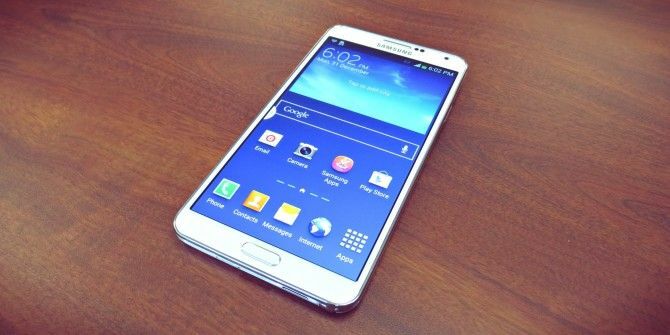 Is the Galaxy Note 3 worth getting? If you’re accepting of the larger size (large enough to where it looks a little funny when you hold it up to your face for an actual call), and can justify the higher price compared to the Galaxy S4, then I’d say that you should absolutely get it! While the S Pen is partly useful, and partly just a gimmick; the larger size of the screen, the larger capacity battery, and the better-performing processor make it a very capable phone. Just be sure to attempt to get the phone from your carrier, as the bands vary wildly between models. That’s the only way to make sure that it supports all of your carrier’s bands and network technologies (LTE). However, if you’re not a big fan of the super-sized screen, I’d recommend getting the Galaxy S4, or any phone that sports a Qualcomm Snapdragon 800 processor such as the Nexus 5. Congratulations, Debbie Rinaldi! You would have received an email from jackson@makeuseof.com. Please respond before December 21 to claim your prize. Enquires beyond this date will not be entertained. Any chance MakeUseOf can have a digital artist review these and other Wacom technology equipped devices?! Seriously, this is where Apple is getting whooped by the competition, and I'd love to see a comparison between the Samsung and Apple devices using the various Wacom and other tools out there (and maybe an HTC & Lenovo device with the N-Trig stylus technology). I would make the back completely of aluminium or maybe carbon fiber :D !! I would change it's name from Samsung Galaxy Note 3 to Samsung MAKEUSEOF 3. I would make it butterfinger proof. I tent to drop things sometimes. I wish it came in different colors. I would make it a little smaller. I would change the color options, white is cool, but some brushed stainless or even nickle would be amazing! I would dearly LOVE to have this, but I've got to say I got a chuckle from the description of it as a massive phone. The nice young man saying that was not even alive when I was lugging around a 30 pound bag phone that made me the hottest one on the block! to be completely chrome colored! Make it dockable so I can use it as a full sized laptop! I would change nothing - it's great! I would lower the price! Have a Google Play Edition option! Last day! hope can won! I would give it a 1GB SSD somehow. I would get rid of the touchwiz launcher as the stock. If I could change one thing about the Note 3, it would be to improve the band support across various carriers. Can reduce the size of the bezel. I would shrink the screen and ad a querty keyboard. The only thing I would change is the price. I will make it’s screen size bigger and the phone less expensive. I would get rid of touchwit. I would make it the size of the Samsung Mega. I would change its exterior Aliminium unicast.. I would not change anything ! If I could change one thing about the Note 3, I would add an additional speaker to improve the bass in sounds. I would change the delivery date and address to MY HOUSE! More battery life! Yeah that would be really great! If I would change one thing about the Note 3, I would bring its price down. It's far too expensive at $600+ US. would like to see it offered in different colors eliminating the need for colorful covers. The only change I would like to see, is some sort of actual leather backing. Otherwise it seems flawless! maybe a bigger battery, otherwise is perfect. I hate typos... so I am compelled to fix my comment. I meant to write: I would change its location to my house. I would change it's location to my house. I would change the colors of it. though it will change my life . It's a draw between the price or the size. But most likely the price - it's kind of insane. Tougher and more dust proof so better for the rural areas. I would make the screen a bit bigger so I can just use it as a table. I am not changing anything about Samsung Galaxy Note 3, and i loved it that's Samsung one of the greatest gadget created! The one thing which I could change in the Note 3, hmm......... I would get rid rid of the TouchWiz UI and add stock vanilla Android to it, with added functionalities of whatever the S Pen can do i the vanilla itself. I would modify its audio and sound quality so that the music lovers like me can get more in one device. I would change the price. It looks fab, I wouldn't change it! I would change the ghastly OLED screen with a LCD IGZO or LTPS one. can't tell you till I use one! I would change the casing to something a little more durable and a pretier color. Better Audio output from the speaker. I would like to have one! I don't have one now, that would be the change I would like!! nothing, love the way it is. i wouldnt change anything about it. its my favorite phone on the market right now. Looks good, would have to try it first! I would change the colour!! Just one day left! I'm so excited !! Make it lighter and have colourful casing. Make the screen bigger. I am a movie lover and I'd like to watch movies in a little bigger screen. Need not anymore necessary upgrades. I'll need to see it first to see what change I'd like in it. Change the tablet skin and add more Samsung Apps. Note 3 don't need any changes to be done. It's perfect already. But if i could change one thing about note 3, i would change the lenses from 13 megapixel to 16 megapixel. So, the quality of a picture and video would be better. Right now the only thing I would change is me owning it! I would change the case from plastic to a solid, lightweight metal. Something I'd change? Making it a bit cheaper would be good. Would love to see camera filters like the iPhone 5s. But LOVING this phone want it so bad! what i wil change is the background and setting so it wil be easy to sue the phone and faster acces to my social networks instead of using my computer because i don't have a smartphone. Having Note3 would be da bomb. I would change Note 3 with stronger chasis and S4 Active like body. If I could change one thing about the Note 3 it would have to be the glass. I have owned multiple Android based Samsung devices all of which top of the line and the Super Amoled displays are stunningly brilliant and absolutely beautiful, however the one issue that I have had with all of the devices is the outer glass is extremely thin and very easy to crack . Typically it doesn't render the device useless, but even a hairline thin crack ruins the beauty and crispness of the Super Amoled display not to mention it's also seriously depressing to see every time you use your $700 phone. i would love to have front facing stereo speakers. Or at least have them on both sides of the device. Note 3 no doubt is one of the best phablet out there, but still there is a chance, a chance for improvement, I would change the touchwiz ui, not with with pure Android but with less touchwiz. I would love a Note3 as I have the Note2 ... One thing I would change is some of the pre-installed software. I would say, Decrease the price and improve the battery life. I can't say I'd change anything until I've used it to decide which features I like and dislike. Definitely the size should be changed a bit. 'tis too big. Decrease the price, increase perfomance, improve battery life. Improve battery life would be great. i dont want to change anything as of now...!!! I would change the interface. Yeah Touchwiz, I'm lookin' at you. Stock Nova Launcher works better, IMO. I would change the camera to take better quality photos. I would change the software. I'm not a fan of TouchWiz. Redesign Samsung Touchwiz to make it cleaner and less cluttered. And remove those hardware buttons and replace it with on-screen buttons. I'd like to see an optional "genuine leather" back cover in the package. I would decrease the price for wider market acceptance of Phablets. Not sure there is anything I'd change. I've had the Note & the Note II and both have been fantastic. My favourite phones ever and I'd never have anything else. if i could - i would change the galaxy note 3 price - so it would be easier for much more people to enjoy it! If they increase the power saving or longevity of the battery it will make a big difference for convenience factor. The price! I would love one but can't afford it! I'd change the size. I wish it was a bit smaller like Galaxy Note II size. I'd like to have a bigger capacity battery. Maybe I would make the screen bigger just a little bit. I cannot say what I would change about the phone, because after playing around with it briefly at the store and reading this review, I cannot determine yet, BUT I do know the fact that Samsung is quite slow with rolling out new Android updates for its phones and so I would like to see that changed for the Note 3. Other than that, this thing is a beast already! Hard to say what I'd change without actually having the phone but can't go wrong with a better battery and/or camera. I would make it just a bit bigger. I'd make the price more affordable. The price, but I would also like to see more color options. I would definitly change the screen size :) ! I'll change its color into white cream! I would have to agree... The Price need to come down just a litt. I would like it's battery lasts longer! i would change its speaker. Would Change the back side. i would change the width so it was a little more palmable. yes, that's a word now. Perhaps I would change the screen size. Without trying it first then I can comment further about what changes are necessary. I really don't prefer the Touchwiz UI, but considering the specs, it's a really great compromise in anyone's interest. I would just put improved speakers on the galaxy note 3. Change back to Note 2 screen size. The one thing I'd change is to make it a Google Experience device. Other than that, it's great. i would change the build quality and design of note 3 . I would add one more speaker and basses. I would lower the price!! Thanks for the giveaway!! Nice review hope I win. If i could change one thing about this phone is the price! Samsung will make more money. I would like to see it come in a lot of different colors. I'd love to see the price become a little more affordable. I would change the price... so more people can afford it. Maybe use Gorilla Glass technology. One thing to change about Note 3? Body design, it looks boringly similar to all the 77 models before it. because samsung note 3 seems perfect. I WILL MAKE IT INDESTRUCTIBLE. So that I won't have to buy another phone. I own the Samsung Galaxy Tab 2. Samsung has great stuff. The screen! A bigger screen would probably suffice. I would love to see soft keys like Nexus devices on it. The only thing I would like would be a smaller price. I will change Note 3's cover and make it more rigid.. metallic! Other than that, its a perfect phone! I would like to change its overlying samsung ui and keep stock android. it will be really fast then. Make it modular for better options like camera megapixel size, battery capacity, local connectivity.. I'd want a longer battery life! I wouldn't change anything. I broke my S3, and then my baby broke my old G2, so I've been using my ancient G1 for the past month. This would be infinitely better just as it is! Maybe I would use actual leather for the back of the phone, instead of the faux leather. It would make it super luxurious! Battery life. some sort of solar charging would be nice. would have made it smaller. To pure metallic body ! I would make it cheaper! dont know, need to use one. but i think it would be the size. Add solar panel on back side for charging when not in use and away from convenient power source. hmm I think i will change it's style of being a phone ! I put an extra keypad! I probably change the speaker quality. Make it even more bigger. Would love to have this. Thanks for the chance. Probably the startup time and the features starting at booting the phone. As with all smartphones of course. Haven't tried a Note 3 yet so can't say. The fact that it is not in my possession? I have no idea, I haven't used it. I'd change the plastic shell. I think an aluminium one would be much nicer. Price! Love the device, can't aford it. Sorry for the previous post, gave the wrong email. I'd give it a better front camera. Front cameras have basically replaced the modern camera for many when it comes to taking the famous "selcas." I'm tired of having to blindly take a picture from the back if I want a selfie. i want to change its casing into aluminum case. Based on the review, the only thing I could thing about changing on the phone would be speaker placement. That one thing, I would like to change in Samsung Galaxy Note 3 would be its build quality. I would like Samsung Galaxy Note 3 to have same build quality as iPhone 5s has, i.e., entire phone body built in aluminum case rather than plastic. So that I can distinctly flaunt my Galaxy Note in front of my friends and leave them gaping at it, without having to tell product's identity (name). The obscene price is the biggest thing I would change. That costs more than about half the laptops out there. I wouldn't change anything. I would like it to have a good battery so it lasts long. I’d make it wireless charging! I wouldn't change anything...its perfect. I'd make it wireless charging! So that it could charge the battery everytime without realising it! love this, this would be one thing I would give to myself or my niece or myself or my niece - okay she wins. love her, love you thanks for opportunity! I hope they don't include their bundled app. Much better if this is optional and can be downloaded in their website. I'd get rid of more of the Samsung bloatware. The size - it's nice when you're using it as a tablet but not as comfortable when using it for a phone I would think. I'd change the case finish to include a metal frame. I would give it twice the battery life, because by the looks of it, I'd be using it non-stop! I would change how much it cost. Samsung Galaxy Note 3 is considered among the top smartphones of 2013 and I am quite sure that Samsung will lead in the next year too. I don't know from where they bring such an innovative concepts in their phones but they give what we deserve. I recently bought my Galaxy Note 3 and I am fully satisfied with its performance and design. a bit large for me. If I could change one thing about the Samsung Galaxy Note 3, I would try to make the device FREE from any types of SIM Lock restriction which is probably one of the Biggest Problem in these devices. If I could change one thing about the Note 3, I would have it made by Apple. I would add probably even bigger screen (because I find tablets better that phones because of their bigger screen). There are handsfree headsets that deal with all that phablet hassle. If I could change one thing about the Samsung Galaxy Note 3 I would try to make the overall device a tad bit smaller. it's a perfect android phone till date, i dont want any change in it. If I would change one thing in Note 3 will the size of its screen. i would change the battery that can last more than a day when fully used. If I could change one thing, I would add a slide out keyboard. I need bigger pocket for this one! I would change the colour. I'd make it a bit smaller. I will change the color, that's all. If I could change one thing about the Galaxy Note 3, I would give it a better quality case -- get rid of that plastic!!! Nothing. I think it's perfect. I would like to change the world by using this smart galaxy note3!!! Saw this on television and would love to play with it! A change would be to make touchwiz use less RAM... Other than that, the new Samsung hardware & software work great... ROOT the phone & ur ready for anything!! Needs to ship with the SIMM unlocked so it can be used while traveling overseas. I'd make it a bit smaller..
That faux-leather back has to go! I've never even owned a smart phone so I don't have a clue what to change! Change the speaker. I need something with good sound for music streaming. That I would win it first! Make it a little bit thinner perhaps.. I would get rid of the physical home button. I don't think I'd change anything because it fits my needs for sketching and notetaking in one device. I don't like carrying a lot of things on me so a device that is large enough to browse, make calls and take my notes is great! Much longer battery life while in use. The design; I'd put the internals in an unibody aluminum shell. I would love it anyway as it would be my first android phone....very exicted! I will remove the stitch at the back cover for a nicer and cleaner look. I have a Galaxy S2 and would LOVE to upgrade! Nothing! I think it's perfect for me. The sides of the Note 3. I will make it a full black. I wish Note 3 had a clear bass sounds. I love listening to loud music! :-) But overall its a great phone/phablet. The color and also the price. I eon't think I would change anything that i can tell. I have never used one but i would be excited to try one for sure. I'd like to go to the plug-in concept. Small phone that plugs into a larger display/battery as an integrated thing, not plugging a USB cord in. Price it under $200. If a high quality tablet like a Nexus 7 can sell for ~$200 or so, why can't smartphones be priced comparably? Why are they still selling for $600 or more? I'm not sure I'm going to like that pen, but I'll give it a shot! I wish it was just a bit smaller. Building materials maybe... add something a little more rugged in there - metal or even carbon fiber as someone suggested. I'd give it a 4:3 aspect ratio. Make the screen size smaller. Aluminum back cover. Expensive phones must be metallic not plastic. make it at least 6"
I'll be honest I don't think I would change anything. I would increase the screen size to 6 inches or 6.5 inches. I've never used one, but from the looks of it I'd say to make it shorter length wise. First I would change the case to carbon fiber instead of plastic. Second I would in-bead a solar panel in to the battery cover for on the charging. The price could be smaller but the screen is just the right size. I don't make calls very often so I'm not too concerned about looking silly. make the edges smooth rather than the bevel. Cheaper or bigger screen. I'm okay with the size, but it's priced like it's larger. I would change the speaker. Add more bass, I'm a music freak so that's kinda important to me. Of course, we would always like to see it less expensive. I'm not sure if I would change anything or not as I have never used one personally. I do have a couple of friends who rave about their Samsung Mobility products and word of mouth is, by far the best form of marketing. I would love the opportunity to own one of these as I am working on opening my own little jewellery business here in my little town. The Samsung Galaxy Note 3 would definitely aide me in organizing it all, as well as keep me in tune with what's going on in the trending fashion world. I wish everyone good luck!! I would change the price, Ouch! I agree with the waterproof comment and cheaper. Not sure if it does, but make it wireless print docs & photos. Make it a little bit cheaper! I would add it e-ink, haha. Thank you! Build in networking to connect directly to computers. I don't want any changes, as it looks good in the current form. i would like the change of plastic quality the back cover. I would make it waterproof and able to fold in half like a flip phone. The future is bright. add wireless charging to the phone as a default option. Make it a bit more compact. I'd add a 3D camera. I would make it either smaller or bigger! No idea yet because I have not used it. I would make it with more colors and maybe come with better speakers. But its nice as it says also. thank you! The size might need to be a little smaller. I'm sure my husband wouldn't complain though. I would make it curved and maybe some touch of wood along with leather. Otherwise it's perfect. To make any changes , I would like to use the Note 3 and then comment. i would change the quality of the plastic that is there. price.to make it more less expensive. I would remove all the bloatware Samsung adds and make it pure Google. Otherwise it's a great device with loads of functionality and usefulness. I don't find anything to be changed with the galaxy note 3 because I find it so good. The one thing I would change is that they would offer a dark green color Samsung Galaxy Note 3. I would make it come in different colors. Large screens are nice, but a pain to carry around. Some way to retract /roll up the screen would be a game changer. I would reduce the price to be more competitive in the market. Seems just a bit large. I would make them a bit less expensive!!! Thanks for the chance to win one!! I'd love to see multicarrier LTE support and a version with a physical keyboard would be great for my usual uses. I think a tad bit smaller would better, but this size would make it easy to find in my bag. Love the phone, but it is a little too big for small hands. size of the phone... it's kinda big. I would have better speakers on Note 3. The one thing i would change: Make the bumper out of real metal and have it extend over the glass in a lip to better protect the glass screen. Samsung makes amazing phones, but the plastic feels cheap. Why do they make their flagship model entirely out of plastic? Its extremely light weight compared to most other phones. They could have beefed up the feel a bit. I wish it had a tad bit smaller "foot print"
Great giveaway with a great amoled display :p samsung always on TOP! I would make it using the Note 2's dimensions. Honestly the battery life seems like it could've been better. I mean another phone is promising 48 hours! Just a tad smaller without giving up screen real estate. It could be a smoother android-based phone ever ! I think they should make it a bit cheaper so more people can afford it. Everything is ok..maybe the prize! Smaller size so that it can fit in my pocket nicely. I would make it BIGGER!! Chnage the quality of plastics used. Change the battery life regarding to the powerful aspects of the device it would be just perfect if it had a bigger batter!!! I would have it not include TouchWiz. But aren't the Note 3's window features cool? Oh yeah, bigger battery. You can always use a bigger battery! Make it cheaper of course! the widget isn't working for me.... tried it on 3 different browsers on 2 different pc's & still nothing... any suggestions? I don't like when ppl comment silly stuff ! Make it the size of Note 2. That it should be mine! I would upgrade the front facing camera, more megapixels! Otherwise amazing phone. I would use "softer" plastic. Is that your kids hand in the picture? I would make the phone smaller. Great phone. I would make it smaller. I don't see a thing I would change about it. Nothing at all, It is just perfect! One thing I would change is TouchWiz, it's long overdue for a refresh! Change the color to rose gold ! I would like to change the price to be more cheap.. Nothing, Its Perfect for Me !!! Love Samsung and the S Pen !!! Battery life and memory is what I would change. Nothing! This phone is just excellent! Nothing. This is too perfect for me. Love Samsung!! The battery life and the unlocked phone's pricing. Battery Life to be longer and the Camera feature , to include fingerprint sensor . I would change the color to black. Built in capacity could be better. 32gb doesn't cut it anymore. Sure, you could use an SD card but I'd rather a quick access NAND storage on board. From what I've seen, the battery life could always be better, even if its near perfect right now. Perhaps make it a bit smaller thereby making it more portable. I hate the stitch design at the back. I'm currently a Note 1 user and the stylus is a little awkward to grip and use. I've not tried the stylus for Note III but I would certainly appreciate a bigger and more sturdy stylus. Thanks for this review and giveaway by the way. I would up the front facing cam to 4MP. I like people on chat to see clearly what's behind me. More memory. Give it some oomph. I would have liked the 5 inch factor at max but I can see the demand for bigger screen sizes...But, one thing that has absolutely stopped me from trying Samsung is a good casing of metal!! I like S4 Active but that doesn't have specifications that can drive me towards it!!! I go for newest Technology only if it can show me some real improvements!! Plus I would wipe off the Touchwiz layer completely to test that high performance device to its limits!!!! I would change the casing it looks awful fragile. I would make the corners less rounded to improve the aesthetics. I would definitely change the plastic body. I think an anodized unibody aluminum body would fit such a high-range phone. Having a plastic phone, especially at its price and high performance, kind of decreases its 'credibility' for a lack of better word. If I could change one thing, it would be the price. I just bought a Galaxy Tab 3 7 inch. Now that's more like it! Make it lighter and slimmer. Joined :) Hope to win! change the material cover. the cover should be strong if compare to the price. I would move the buttons along the side of the phone down a little for easier access. Good if it had a more metallic finish. Would look more professional if it did. Even bigger battery. Change the plastic feel. If I could change any one thing about the Note III I would have it come with fewer pre-loaded apps/software. I would get rid of the stylus, lighter, thinner. I would make it a tad smaller. I would change it to pink! The color scheme, Black at the front would hide the sensors perfectly, and white at the back will still be beautifully flashy. I will replace Touchwiz with CyanogenMod. I would probably change the UI because some say its not good..but other than that its perfect. I would make it a bit smaller. I would honestly change the colors and back plating. I really like the plastic feel and don't want something to scratch up or wear down. Seems pretty good as-is to me. Maybe alternate backplate versions, like the Moto G? It needs personality with color! Orange or pink. Purple or green! I would change that fake leather back. If you are going to make a premium device, go all the way and use real leather! Other than that, awesome phone. I would make it available in something like a gunmetal grey. Make the casing a completely metal, so it justifies for better aesthetics and feel. I would change the colour. Give it some more options. I really want to win this Giveaway because i dont have any Android phone or Tablet and i would like to win one. I would change it from your hand to mine. The screen is too small, haha. If I could change one thing about the Note 3, it would be the (slippery) plastic back that a lot of people complained about. This one is awesome! I've had it in my hands, and it's the smoothest android smartphone I've tried in my life. It looks pretty good as is! like to change its plastic body to metal body. I would have it made out f better, sturdier materials, rather than the normal cheap-y plastic. I like it the way it is. I would just change it from your hands to mine!! If I could change anything about the Note 3, I would make the home button recognize the stylus just like the capacitive buttons. I would change the screen size a bit. Maybe make it a bit smaller. I would change the plastic body to all aluminum. I would take it just the way it is. I was all happy. I would change touch wizz. While the features are awesome, it causes phone to run worse than they should be able to. I'd change the plastic body…. I would change me not having it in my hands (too big for one hand). Definitely change the plastic body....For such a high range phone, material body looks flimsy. If I could change anything, I would drop the Touchwiz. The materials it is made of, something else besides plastic. I would take it just the way it is. I would like to change the fact I don't own it yet. If I could change one thing, I would want it to run stock Android with all the stylus features. changing where it is made. Wish it was made in the U.S.A.
i think i would like a longer battery life and longer warranty. Price - I'd like to see it under $600 at least. nothing, it's good like that. The one thing I would change would be longer battery life. I would change the fact that I don't have one! Love the size and power..but the price could be a little more attainable. Nothing to change, its Great! Stereo speakers would have been nice. The front-facing camera for a higher number of pixels. I would use a Snapdragon instead of the awful Exynos Octa. The big screen eats battery... a longer battery life would be nice! I would like it better if the price was lower! Nothing, all is fine to me. I'd make it cost less. well I would have to own the phone to know what to change, otherwise, mayb the price? It would be perfect if priced much lower! Price (lower msrp) otherwise I think it is pretty good as is! relocate power button to top. Like most others I can say only the price..the technology is terrific. I truly would not change a thing. I love this phone and would love a chance to try it. I don't think I would change anything at all. This is pure beauty as it is. A full metal case would be nice. I would make it smaller. Can't find anything wrong with it! Yes, without a doubt, the price. Other than that it's an excellent piece of kit. Nothing needs to be changed! Well...if I must, maybe the price? I would let google design and make it instead of samsung. Google Nexus 5 is awesome! It 'a wonderful phablet! It has a beautiful screen and pen and its functions is really the best! I like it very much! I don't have note 3, so I don't know what to change. If I get it for sure I can tell what can be change.